This week, I can’t wait for a book that has an ordinary girl, a teenage movie star, a bunch of emails, and maybe, just maybe, love. Fifteen-year-old Izzy Brannick was trained to fight monsters. For centuries, her family has hunted magical creatures. But when Izzy’s older sister vanishes without a trace while on a job, Izzy’s mom decides they need to take a break. Izzy and her mom move to a new town, but they soon discover it’s not as normal as it appears. A series of hauntings has been plaguing the local high school, and Izzy is determined to prove her worth and investigate. But assuming the guise of an average teenager is easier said than done. For a tough girl who’s always been on her own, it’s strange to suddenly make friends and maybe even have a crush. 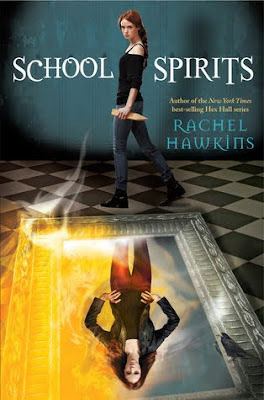 Rachel Hawkins’ delightful spin-off brings the same wit and charm as the New York Times best-selling Hex Hall series. Get ready for more magic, mystery and romance! I love Hex Hall. The humor, jokes, and Sophie made Hex Hall such a good read. When I heard that there was a spin-off, my jaw dropped open and I thought oh my goodness, I have got to get my hands on that book! Rachel Hawkins’ School Spirits series is focused on Izzy. She’s sassy, smart, and I absolutely can’t wait to read more about her! And while you’re here, why not enter my giveaway? I also loved Hex Hall Series! I definitely can’t wait for this one too! Great pick!